I'll never forget finding my first gray hair at the tender age of 25. As soon as I saw the wiry, stubby little thing, I plucked it from my head and stared at it in disbelief. I even held it up to the light to make sure it wasn’t just a lighter hair mixed in with my chestnut-colored mane. There was no mistake about it: The pure white tendril was mine. Since then, I’ve watched many more white hairs emerge from my roots. I don’t pluck them as much as I used to, and I’ve learned to live with them, but I’d be lying if I said I was totally at peace with it. 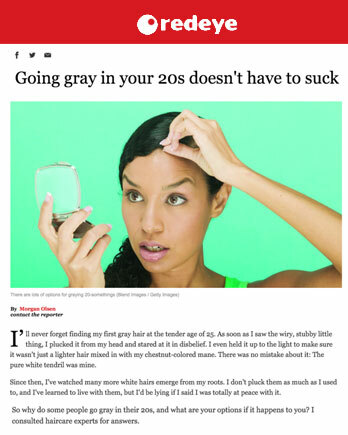 So why do some people go gray in their 20s, and what are your options if it happens to you? I consulted haircare experts for answers. The first thing you should know about grays is that they’re probably not a result of your 70-hour workweek. Although most people don’t develop gray hairs until their 30s or 40s, it’s not uncommon for 20-somethings to start the process early—especially if it’s in their genes. "If your mom or dad or someone else in your family started graying in their 20s, then you might be more likely to start graying early also,” Barbosa explained. But in a world where granny hair is a trend (no, really), premature graying doesn’t have to be the end of the world. More good news: There are a lot of options when it comes to dealing with those pesky white hairs. Tina Deeke, stylist and color specialist at Maxine Salon in Near North, said most clients who are interested in coloring their hair do one of three things: highlights, lowlights or demi-permanent color. When highlights and lowlights don’t cut it, all-over color is an option. Demi-permanent color is the sweet spot between semi-permanent and permanent hair color. It’s all-over color that can blend grays, enhance your natural tone and add shine. Of course, when grays pop up, it can be tempting to run to the drugstore and grab a box dye or a root touch-up kit, but Deeke said those can create bigger problems. So what about plucking those grays out at first sight? The experts agree that pulling a few here and there won’t do major damage to your locks, but ripping the same hairs again and again can hurt you in the long run. Oh, and what about that old wives’ tale that plucking one gray causes two more to grow in its place? “This is just a common myth,” Barbosa said.